There’s an app for this. 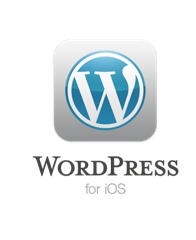 Just today I looked to see what apps are available for iPad for WordPress, and there it was WordPress for iPad. So naturally I had to try it. There is one setting to enable on your blogs.oregonstate.edu blog after you install it, but then voila. The device will tell you what to change after you set up blogs.oregonstate.edu/your-blog-name/wp-admin in the interface with your ONID ID and password, and then attempt to connect. That is all it takes, and you are able to write and publish to your OSU blog from your iOS device. For more information, visit http://ios.wordpress.org. Have you seen our new look? Not this blog, but the OSU Authentic WordPress Theme? If not, it is here, and you are looking at it actually. If you are using the OSU Standard Theme, here is a great way to complement a blog you might have with the OSU Standard Theme. OSU Authentic is the preferred theme for administrative departments, programs and academic units and will be available only for the Faculty, Staff and Department blogs. For more information about this theme, visit the Help blog. © 2019 OSU Web Services, all rights reserved.